Other than thinking about my travel journal challenge entry (or entries?) and reading other peoples’ blogs, I haven’t had hardly any time to do anything bookly. For the next eight weeks – well, a little over seven, now – I’m going straight from work to class. I’m taking an educational psychology course for three weeks, followed by a curriculum and classroom management course for five weeks. Hooray for the whirlwind graduate program! This is leaving me very little time to read anything other than textbooks, and even less time to write or make anything. So… I hope you’ll forgive me if I post a third entry in a row with just links and stuff. Many thanks to Neatorama, How About Orange (who wins my Favorite Blog Name Award), and Cuteable. If you like robots, monsters, and/or art, and would like to donate to a good cause, you might look into Joe Alterio’s project. You provide him with three descriptors (mundane as color or abstract as you’d like) and a donation, and he’ll send you a 6″x6″ piece of original art depicting a robot or monster (your choice) bearing those characteristics. Proceeds support the San Francisco AIDS Marathon this July. Speaking of robots… here’s another thing that makes my inner (oh, who do I think I’m fooling?) grrlgeek swoon. I love what designers are doing with bookshelves these days. This skyline shelf probably wouldn’t look nearly as cool with books on it (well, it would be cool in a different way) but it’s still pretty fantastic. Sorry, kids, it’s not magic: how an Etch-a-Sketch works. I’ve been invited to the Facebook, Xanga, and MySpace groups called “I Judge You When You Use Poor Grammar,” which is sad because I don’t, except if you say “funner,” which automatically puts you on my “person of questionable moral fiber” list. (If you’re an educator or, God forbid, someone who studied English, you get an automatic notation on the Red Crayon List.) Anyway, they’ve got some fun swag in three different styles. I like the first one. It’s things like these adorable biplane spoons that really make me wish I had a baby. RIGHT NOW. It must have been amazing to live in a time and place when random people owned lions and kept them in public places. Of course, if I didn’t live in THIS time and place, I wouldn’t have the option of a really snazzy looking electric bicycle for my commute. Anyone want to give me $1,500 for a bike? As Hank Green of EcoGeek (and Brotherhood 2.0, which I love – go nerdfighters!) points out, that’s not bad for a new car. Fun craft projects for people who have more time than I do: small paper boxes, decorative envelopes, and pinwheels (my husband NEEEEEEEEEEDS one!). There’s also this website with its beautiful little origami projects. I’m utterly fascinated by origami, and utterly hopeless at it. The byline for this site is “Origami Designed to Be Better” – maybe that means it isn’t so impossible to figure out! These remind me of my Sock Creatures book (I’m determined to make them some day! 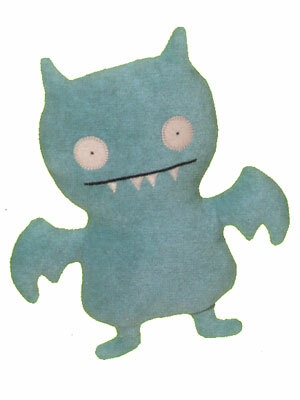 ), which in turn remind me of Uglydolls (I love Icebat). There’s something very endearing about stuffed animal monsters. Don’t like the ones with the wrong number of eyeballs as much, though. And finally – and we’re burying this at the end because it’s the coolest thing ever and I don’t want to share because I want to be the only cool person on the block who does this – let’s talk about customizable Kleenex boxes. Oh yeah. You heard me right. DESIGN YOUR OWN KLEENEX BOXES. Entry filed under: Just for Fun, Shopping, Surfing. Cute	It’s Raining Books, Hallelujah! Now I want to shop!